On the morning of Friday 5th March most people were watching, waiting and wondering why the Bureau of Meteorology hadn't declared a Tropical Cyclone watch or Warning for the Cooloola coastal region as a 994 HPA low moved West South-West towards Hervey Bay. In fact it was rather confusing as the SEWS (Severe Emergency Warning Signal) was broadcast on radio and television in the region quite a few times from about 11:00am on Friday. It appears that this low was on the borderline of being a category 1 tropical cyclone and an East Coast Low. The system was actually a complex one consisting of two lows, the most eastern low heading on a southerly course but when combined with a large high pressure system down south it was tightening the pressure gradient and packing winds of 50 knots with gusts up to 120 km/h on the Sunshine Coast. The low pressure system developed in a monsoonal trough in the Coral Sea on Tuesday and moved SW toward Hervey Bay where the western low of 995 HPA crossed the coast at 8:00pm on Friday night. High seas a washing machine action stir up plenty of foam on the beach at Maroochydore. Most of the severe weather action happened in a line from Double Island Point and south to the Gold Coast, Gympie missed the brunt of the winds but did receive some very solid rainfall. Very damaging winds affected the area from Caloundra to Coolangatta and as far inland as Kingaroy and Stanthorpe. 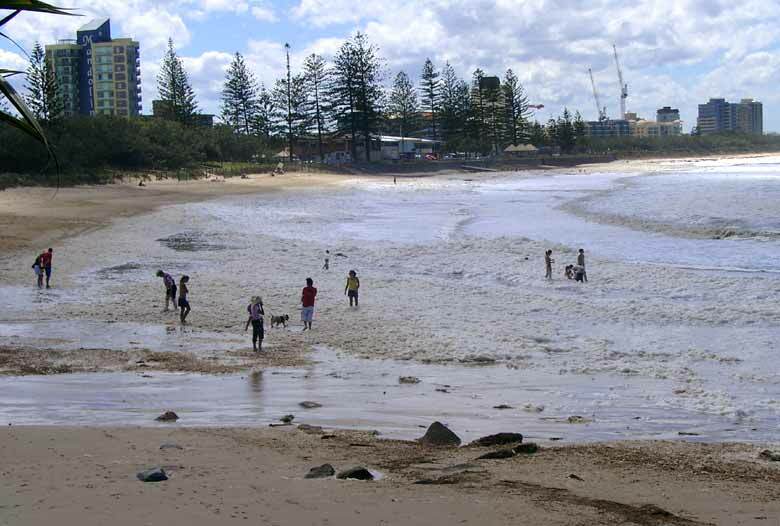 A wave recording device a kilometre out to sea from Point Lookout registered a 15m high wave early on Saturday morning. The new White's bridge on the Tin Can Bay Road at 5:30am on Saturday. 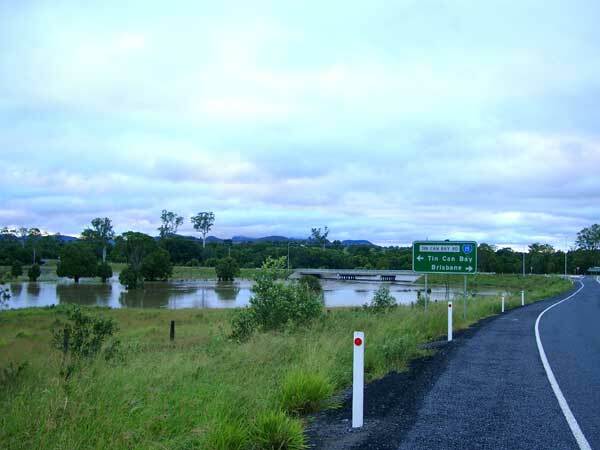 The heavy rain was enough to cause minor flooding in the shire, it washed a couple of cars away as well as doing some damage to farms and homes. 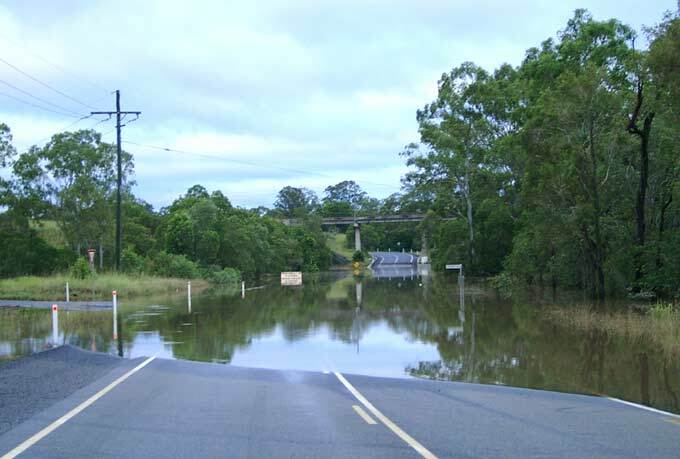 This was Gympie's first significant flood in four years, the Kidd Bridge was closed and under water on Saturday and Sunday. 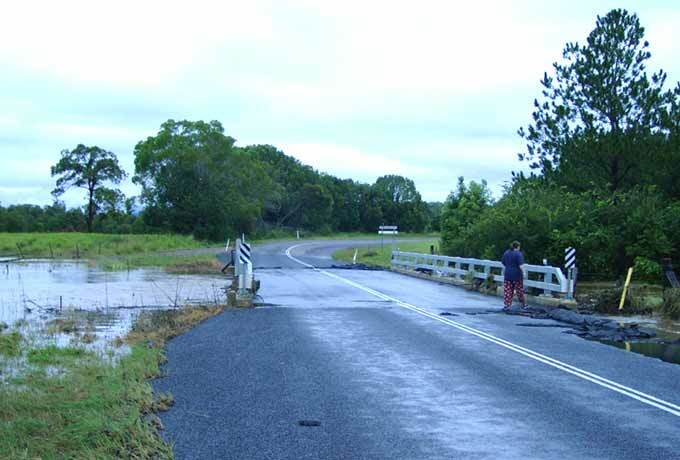 The Mary River's swollen waters peaked at 11.2 metres at 9:00am on Sunday, this was the first time that the bridge had been closed due to flood since the Mary peaked at 9.55 metres in May 2000. 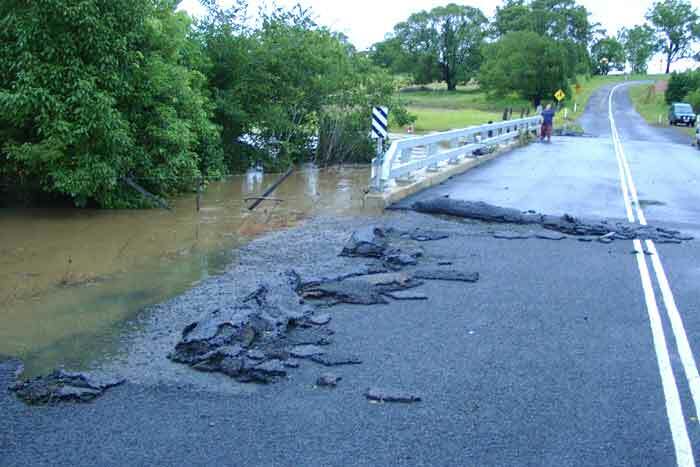 The Bruce Highway remained open throughout the duration, but Tin Can Bay and Rainbow Beach were out of the question on Saturday due to the flooded bridge over Tinana Creek. I believe that some motorists had to go to Tin Can Bay via Maryborough and then down the Cooloola Highway, this was a 160 km trip as against the normal 80 km. The new Borchert's Bridge went under. The force of the water damaging bitumen.